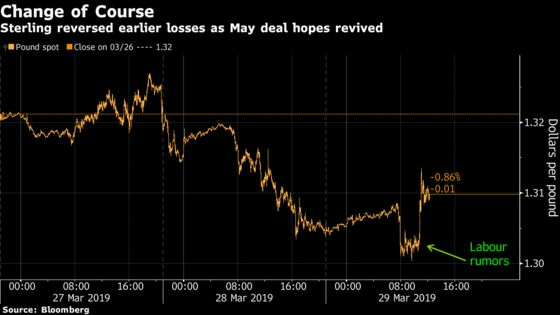 (Bloomberg) -- While the pound may have found support from talk of increased backing for Theresa May’s Brexit plan, it remains vulnerable to a fresh flare-up of no-deal risks should the prime minister be defeated again in Parliament. Even as sterling gained Friday on speculation some members of the opposition Labour Party could back May as she brings her Withdrawal Agreement for a third vote this afternoon, it is still set for a monthly loss of 1.3 percent against the dollar, the worst since October. Odds seem stacked against the premier so far, with her Northern Irish allies in the DUP planning to oppose the plan. If May’s plan is rejected again by lawmakers, the U.K. will have to decide whether to crash out on April 12 without an agreement or ask the European Union for a long extension of the departure date. The British currency has fallen about 0.8 percent this week against the dollar to around $1.3100. It rebounded Friday from an early decline following lawmaker comments suggesting some Labour members could back May. Sterling is still the best Group-of-10 performer of the quarter but coming months look more challenging with no respite in Brexit uncertainty. Implied volatility on two-week pound-dollar options, which cover the current April 12 deadline for the U.K.’s exit, have surged to the highest level since the immediate aftermath of the 2016 Brexit referendum amid increased anxiety about a no-deal outcome.